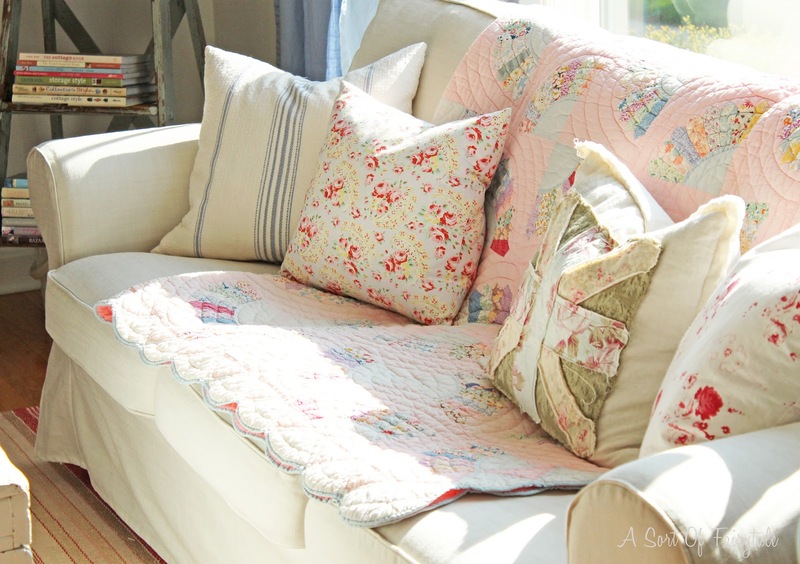 The vintage quilt on the couch is a new find from an estate sale...I just love it! Vintage quilts are my new obsession!! I have rearranged this room countless times! I've had the hardest time getting the furniture placement right. 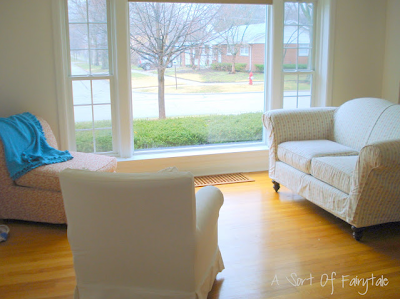 The love seat is a great piece, but is rather large and sits higher than the couch. I still don't care for the different heights, but I like this placement the best so far. it seems to make the most sense for everyday living and for having company over. A little peak into the dining area...will share that space too, later this week. I posted the easy, vintage roses sign tutorial last week, be sure to check it out if you love vintage signs, but Do Not want to fork over the high prices they fetch these days! Can you say, I've come a long way, baby!?! and look forward to so many more great years with my family here! ...compliments of this little bugaroo! I absolutely love it. It looks like the comfiest, most relaxing place ever! I so wish I still lived there. Your home is comfy and full of joy. Happy Cottage Color. I love it! Your space is so bright and cheerful it would make anybody happy to live there. Love your new quilt. And the little girlie sitting on it, too. Oh my goodness, that's such a lovely room and I'll take any pillow or that quilt on your sofa...dreamy! Great job on that rose sign too. 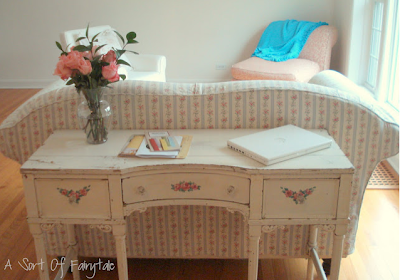 I'm having a "favorite room" linky party over at my blog. I would love it if you would link this up. I so love your cottage style. You HAVE come a long way! This is cottage perfection. Nicely done! This is such a beautiful living room. I think you've done a great job. I particularly like the window hanging in the window. OH my gosh -- so cute! I love your shabby chic style. My hubby would never allow it, but I love to look at it and dream! :) Happy Monday! omg !!!! LOVE your style, colors etc....I love some color! 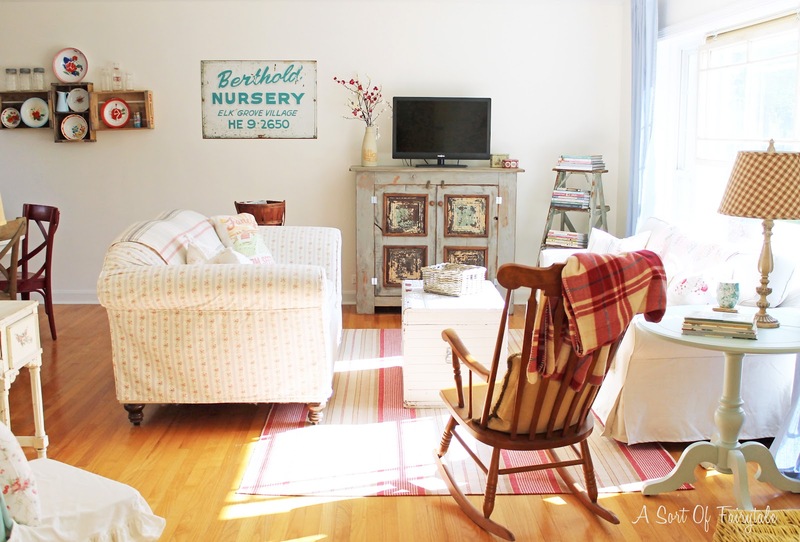 how about an awesome vintage quilt hanging behind the TV ????? Makes a nice graphic statement. So many pretty things to look at in there, I didn't even notice the TV until you mentioned it! Yes, you've come a long way baby!!! I love everything about your pretty home. You've made it so pretty, warm and welcoming. I love it so much, Stacey! You are so good at using color and pattern without it looking too busy. I really love your pillows and all of your accessories...and what would a home be without toys scattered around and a cutie pie to go with them?!! first of all...your little one is adorable. love it!!! your use of color makes me happy. love the books on the ladder. great idea!! oh, that little bugaroo is the best accessory! smooch! as you know, i just adore your style. your sunny home is a delight! once i finish my big deadlines, i have some ideas in mind (me write/you style+photograph). enjoy a sunny day, playing! that little bugaroo is so big now Stacey!! Oh my goodness....and what a cutie! Love your COZY home. It is just perfect. So sweet! I LOVE every bit of it! 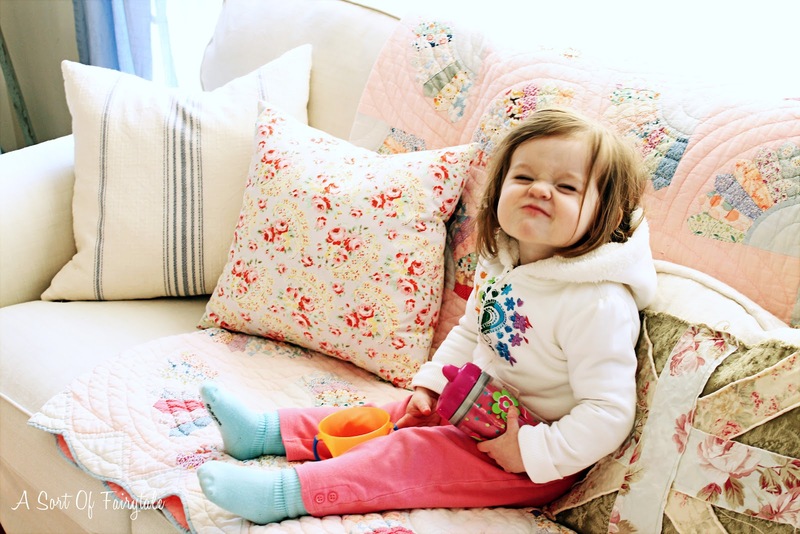 the quilt is absolutely to-die-for, as is your little 'bugaroo'. i'm with you on the vintage quilt obsession, i keep thinking about the ones that got away. your whole room looks great, my friend. well done. Well I personally think your home is adorable! 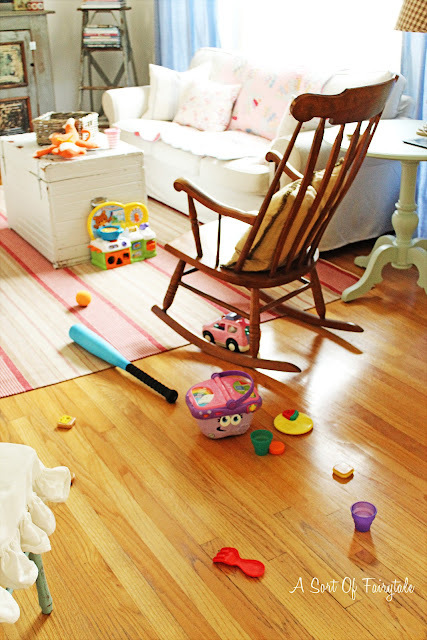 Even with the "mess" your lil' bugaroo makes! :) She just makes the home even more adorable! it all looks so cozy and welcoming! i love the pops of aqua! looks fabulous, and i want that vintage quilt!!! how feminine and chic. look at the baby turn into a big girl! would love to have ya pop by for a visit sometime - giveaway going on now! Aw, that little scrunched up face is the cutest! I can so relate to the toy picture! Your living room is really beautiful! Love all the wonderful light. 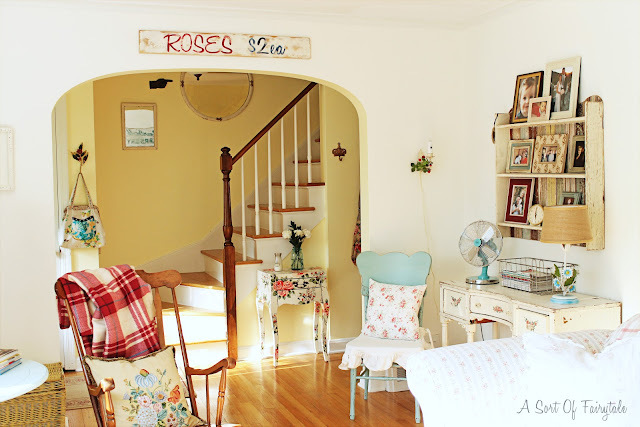 All the great cottage colors make it such a happy, pretty, room! Little Maggie is so adorable! You have soooo come a long way with the living room! Love all of your beautiful touches. I really love the roses sign you made. You could always put feet on the couch to make it sit up higher. They wouldn't even show too much as the slip cover would probably cover them up. Your living room is so cute and comfy. Your daughter is adorable!!! I was dreaming, last night, I was playing Barbies with my neice and daughter. lol I miss that age but am enjoying my daughter's wonderful sense of humor at age 14. 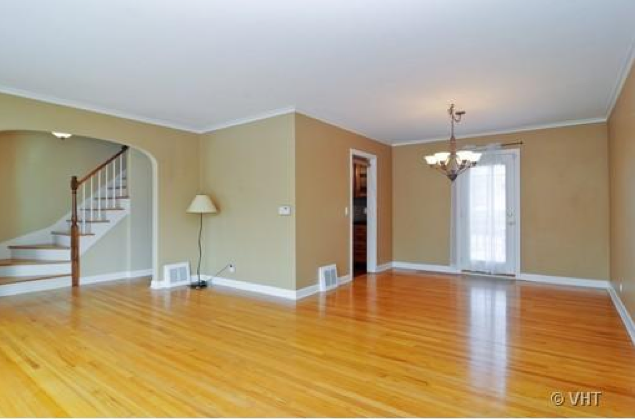 You could put a platform or something under the couch to raise it. Your living space looks just beautiful - love your style!! One word - WOW! I am so envious of this room! I love it! Well done! Stacey you have made this into a lovely family space!! Like you I am always tweaking this ans that! That cuties face is just priceless!! I love your home. The color is so happy and the happy is contagious! I really love your blog. I just had to add you to my blogroll so I don't miss a post! You are inspiring. Oh, that little face--she's ridiculously cute! 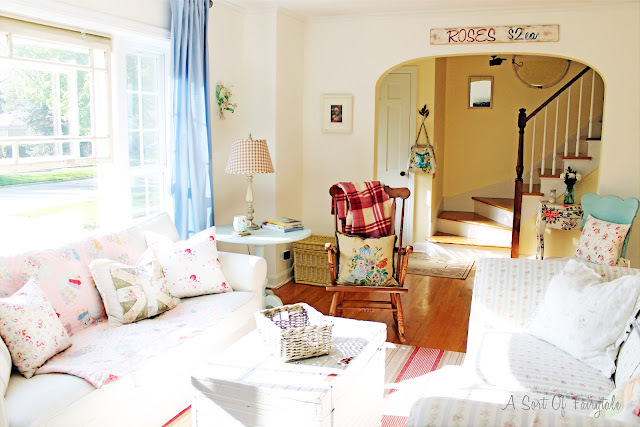 It's so homely (in the British way) and cheerful, cozy and simply perfect. I'm completely swooning over that quilt (love a good Depression-era quilt!) and the pillow covers. and yes, you are blowing up all over pinterest! I am so in love with your cheerful room! it makes me happy just looking at it! 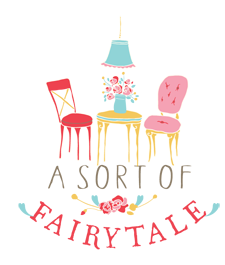 So excited to be your newest follower and thank for stopping by my blog! The toys that used to line my floor have been replaced with 12 year old i-pods, candy wrappers, cell phones ... it never ends! Love your living room! 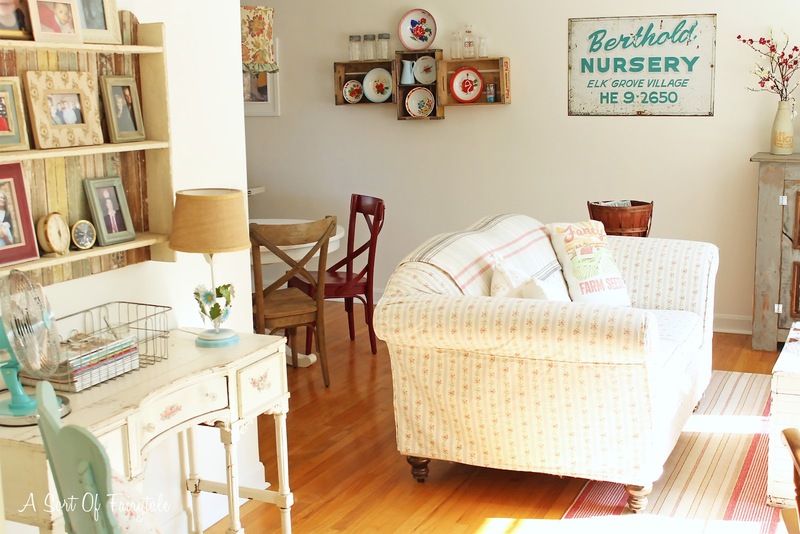 The old signs, the plates, crates, ladder, painted furniture ... it all rocks and is super eclectic (which obviously I love)! Wow! It all looks so great, I just love it all! I'm bummed I missed you the other day, with Maggie. I hear she is adorable, and from her pic here, I can see why. She is a cutie!! Get anything good at Kane? I love this room, so beautiful and she is the cutest thing ever!!! I'll be featuring it later today. Your living room is really sweet and cute -- I really love it! I don't know which is cuter, the room or little boogaroo. You did such a great job. Love the cottage feel. The crate plate holders are so cute! What a cutie your little one is! The room is so pretty and I love all the details. Cottage cozy for sure. LOVE it! So very cute and cozy. Great job! I'm going nuts over your style!! Your home is adorable! You have a real knack for knowing what looks effortlessly beautiful. Your style reminds me a lot of Jane Coslick, a designer who tranforms cottages and bungalows on Tybee Island. We stayed in one of her cottages--The Seabiscuit-- when we vacationed there last year. 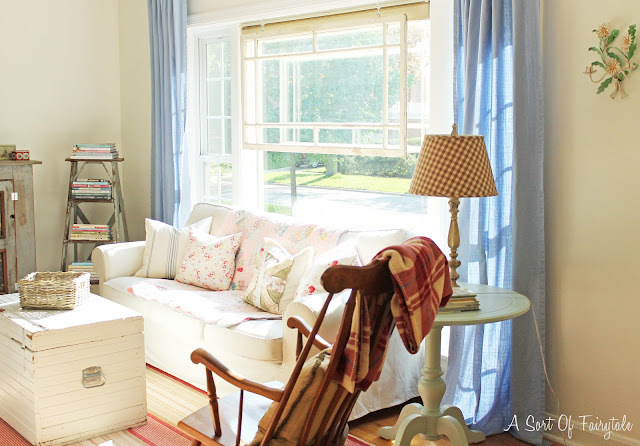 “Vintage window hung within the picture window.” That’s a cool idea! I love how it made such a big difference to the whole appearance of your window! It’s amazing how it gave the space a touch of vintage, which is a very nice complement to the modern style home. I would love to sit on your couch and feel the warm sunlight coming in! Hey! Love your style. In my early stages of decorating. (sort of looks like the bottom pictures ;) I have insanely red couches I'm trying to cover up with couch covers for a "lighter" look. Wondering if that's what you have on yours? If so, where did you get it? I just love it. 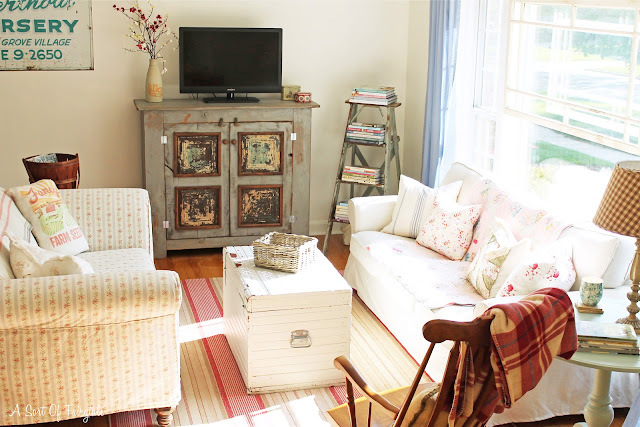 Love your cute cottage style living room. I also have a thing for vintage quilts especially if you can find a bargain. Your little one is so cute.